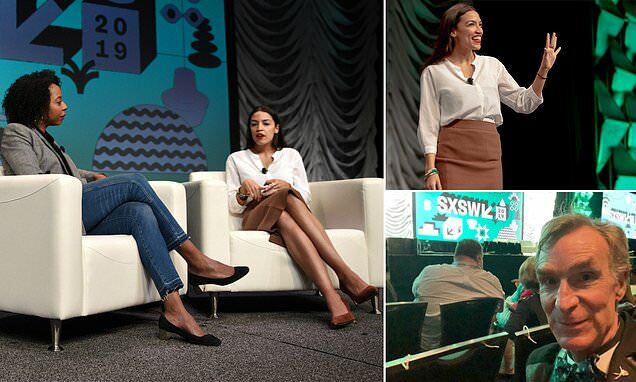 The 2,000 plus ballroom - one of the biggest in the Austin Convention Center - was packed, the overflow rooms were flooded with attendees and Bill Nye tweeted a photo of himself from the room waiting to hear the freshman Democrat from New York speak. The crowd rose to its feet, whooping, cheering and hollering when Ocasio-Cortez entered, but, when she spoke, you could hear a pin drop. Her one-hour talk was filled with economic policy, social policy and what she's learned in her two months as a member of Congress. But her bigger message was one of hope, inclusion and equality, particularly for minorities. She decried the idea of incrementalism, a belief in change via small steps, and said it took big sweeping ideas to make a difference. 'This idea of like 10 percent better than garbage shouldn't be something we settle for,' she said. The crowd cheered her on. Ocasio-Cortez, 29, berated the New Deal, Franklin Roosevelt's massive public works program worshiped by Democrats, as 'an exercise in racism,' arguing it made life and home loans easier for whites but left African Americans and Latinos behind. She pivoted to her Green New Deal, which she claims would focused on those in need first.